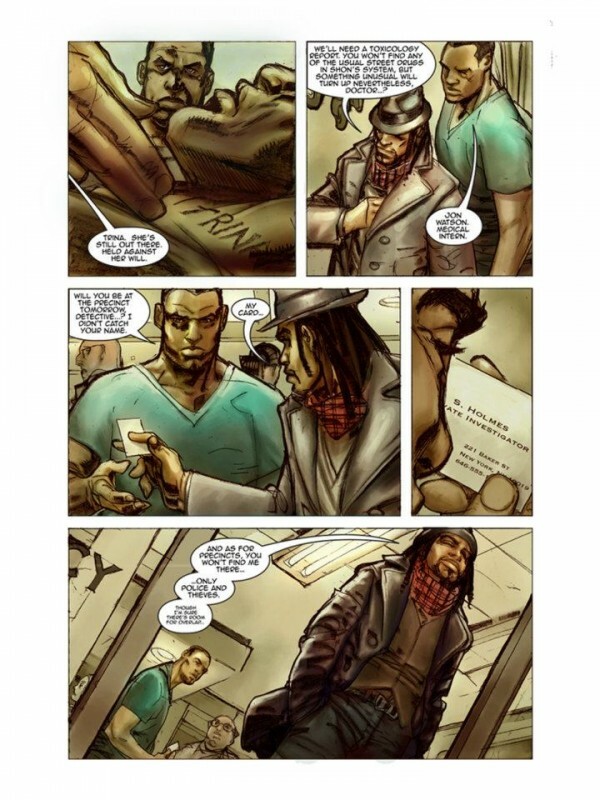 Holmes in Harlem: A Black Sherlock & New Paradigm Studios’ New Comics –er… Paradigm! Sherlock Holmes has been re-imagined and modernized and reinvented a million times. From Gene Wilder as “Sherlock Holmes Smarter Brother” to modernized bromantic Robert Downey Jr. movies, the character has survived a century and half of radical revisions, but New Paradigm Studio’s Watson & Holmes brings us the *first Black Sherlock. And, unlike many of the Holmes-ian re-imaginings, it’s actually good! The venture started out as a digital comic back in 2012, but with overwhelming support on Kickstarter, issue #1 launched as a print comic this past Wednesday, and we’ve got at least 5 issues to look forward to. 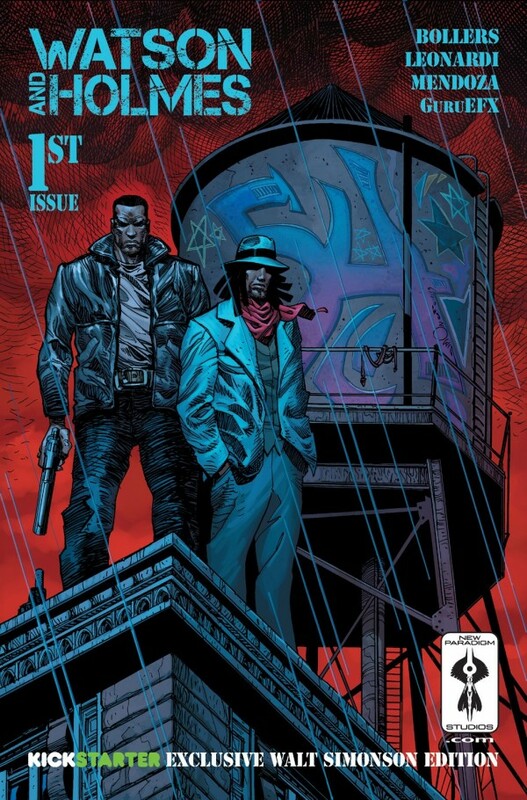 Rick Leonardi and Paul Mendoza‘s art work places the story visually in a gritty noir-ish Harlem, where a seriously too-cool-for-school mystery man named Holmes works the locals and watches the streets for clues to solve local crimes. Under the care of Karl Bollers , the story has all of the flavor of Harlem, with local kids taking a break from play to offer Holmes some useful tips and cast a little side-eye at the new guy John Watson, a doctor medical resident in a local E.R. And apparently fans want more. With a small initial print run of only 3,888 copies, the issue quickly sold out at San Diego Comic Con this year. The comic and the newbie studio has gotten quite a bit of coverage , and with a couple of dope free comics under their belts — The Rockthrower, Nimbus, and the web-comic Justice Is Nocturnal — this certainly won’t be the last we hear of them. The Rockthrower is another interesting gem from the studio, telling the dramedy of a washed up baseball scout who manages to find talent in the oddest of places when he spots a Palestinian kid throwing rocks with impressive accuracy and speed in video footage of the Palestine/Israel conflict. With a crew of comics veterans, edgy creators, and stories that breakdown and remix the traditional, New Paradigm Studios is keeping it geeky and outsidery, and we likes that. So check ’em out. *Well… one of the first. The first Black Sherlock Holmes character actually appeared in a 12-minute silent film A Black Sherlock Holmes produced by the Ebony Film Corporation back in 1918, a film that featured an all-Black cast at a time when white actors were still performing Black stereotypes in black face. Despite the title and the all-Black production company, the film actually followed a character named Knick Carter (played by Sam Robinson) who embodied aspects of Sherlock’s sleuthian personality, but, according to Julie McKuras, A.S.H, B.S.I at the Friends of the Sherlock Holmes Collections, the film’s failure to overcome Black stereotypes received criticism from Black audiences. FYI Watson & Holmes #2 is already available digitally via Comixology. I got both issues and greatly enjoyed them. Loved the two issues of Watson & Holmes. Such a clever idea, and I’m glad they’re not written stereotypically “street”, y’know? Great point! So many comics with a focus on Black characters try to hard (in either direction) and end up missing the mark by a long shot. They did a great job here. Yeah, it could have written like a Black parody ala Sherlock Homeboy, saying “It’s elementary, my n****a” or something like that. But I’m glad they’re playing it straight.